Every year thousands of high school football players dream of scoring a full ride scholarship to college. Football scholarships are some of the most lucrative, and most coveted, financial aid opportunities available. They are also extremely competitive, and only the most exceptional players will have a chance at winning a full tuition football scholarship. While the competition is fierce, winning a football scholarship can do more than just pay for college. Football scholarships carry a great deal of prestige. Regardless of whether or not the student remains in the sporting arena, that prestige will follow them well into their professional careers. The road to winning a football scholarship is long, complicated, and begins early in a student’s high school career. While most students pursuing academic scholarships will begin to prepare applications in their junior and senior years of high school, football players need to begin thinking about scholarships from the moment they join the high school team. College recruiters look at an athletes performance throughout their high school stay, and will often begin singling out exceptional players well before their senior year. College football is one of the most closely followed sports in the United States, and it generates billions of dollars in revenue for colleges, promoters, corporations and television networks. It is a highly competitive sport that attracts only the best, and college recruiters are always on the look out for the next generation of exceptional players. While it may be every high school football player’s dream to make it onto an NCAA team, only the very best will be chosen. For the lucky few, it can mean the start of a bright career in professional football, sports management, coaching or even sports journalism. Unlike most academic scholarships, where applications are accepted from all interested students, football scholarships rely on college recruiters to actively search out the best candidates. High school football players who want to win a scholarship need to work closely with their coaches to not only improve their game, but to catch the attention of college recruiters. This means hours of training, soliciting the coaches and recruiting officers of college teams, and preparing a highlight video that will demonstrate your considerable skills at the game. In many cases students must be recommended by their high school coaches, so it is important to let the coaching staff at your high school know that you intend to try for a football scholarship. Winning a college football scholarship isn’t easy, and it requires talent, tenacity and the will to succeed. The National Collegiate Athletic Association (NCAA) was created more than a century ago as a way to protect student-athletes, and to regulate all aspects of football at the college level. The NCAA consists of three divisions that set the rules by which colleges recruit players and dispense financial aid. Each division is also responsible for regulating the amateur status of players and the rights and responsibilities of coaching personnel, as well as scheduling the practice and playing seasons. All NCAA colleges are bound by the rules of the organization, and are subject to severe penalties for any infringement of those rules. There are 236 NCAA Division I colleges and universities in the United States. These include some of the big name schools like Michigan State, Baylor, UCLA and Florida State. The Division I football teams are the cream of the crop, and only the most exceptional high school players will have access to scholarship money from these school. The NCAA has limited the number of full-ride, and partial tuition, scholarships that Division I schools can offer. Division I colleges are limited to 85 full tuition scholarships per year. Competition for these scholarships is more than fierce, and only the very elite football players will be tapped for recruitment. NCAA Division II schools tend to be smaller public universities or private colleges. These schools have more limited finances than their Division I counterparts, which is reflected in the number of scholarships they can offer. The NCAA limits each Division II school to 36 full, or partial, scholarships per year. With this limited availability of scholarships, Division II schools must look for the best all round players to recruit for their schools. While the Division I schools can offer scholarships to premier quarterbacks, Division II schools tend to look for multi-talented players who can bring a wide range of skills to their teams. While the scholarship opportunities may be more limited, they do provide increased opportunities for the more multifaceted players. The following NCAA endorsed scholarships are available at Division I and Division II colleges and universities. These programs are extremely lucrative but, as we have seen, they are also highly competitive. The Walter Byers Scholarship is a renewable one-year postgraduate scholarship. Annual awards are $24,000. The Jim McKay Scholarship is a $10,000 annual award named in honor of the famous broadcaster. This is a one time award, and is not renewable. The NCAA Postgraduate Scholarship is a one time award of $7,500. The postgraduate scholarship is not specific to football, and may be applied to any NCAA regulated sport. 174 scholarships are awarded annually, divided equally between male and female student athletes. In addition to these scholarships, each Division I and Division II college or university will have their own programs which they make available to high value players. While many of these will be full ride scholarships, schools are beginning to see the value in offering a greater number of partial scholarships as a way of making their recruitment allowances stretch farther. Division III colleges are typically much smaller institutions that place a greater emphasis on academics than their Division I or II counterparts. While Division III schools may very well have excellent football programs, the NCAA restricts them from offering football scholarships of any kind. That does not mean, however, that Division III schools are not looking for exceptional players. But what they are looking for are elite players with firm academic backgrounds. Division III schools may be restricted from offering football scholarships, but they can offer general scholarships and grants to academically impressive students who have excelled at high school football as an extracurricular activity. In this way they can build successful college teams, while bring the best and the brightest to their campuses. Students who wish to pursue football at the college level, and who have strong academic backgrounds, may find that Division III colleges offer the best of both worlds. The National Association of Intercollegiate Athletics (NAIA) offers student-athletes an alternative to the larger NCAA schools. The NAIA is comprised of 257 member colleges and universities across the country. While NAIA colleges may lack the high profile of NCAA schools, they offer many scholarship opportunities for students looking to use their athletic prowess as a stepping stone to a quality education. For those students who are more interested in pursuing a degree than breaking into the majors, NAIA schools offer a way to turn their football skills into scholarship funding to help pay for college. Like the NCAA, the NAIA regulates all aspects of the athletic programs at its member schools. This includes scholarship and grant programs. NAIA colleges and universities are limited to offering the equivalent of 24 full tuition football scholarship per school. Many colleges choose to offer partial awards as a way to increase the number of available scholarships at their school. For example, an NAIA college may offer 2 full scholarships, 20 half scholarships and 48 quarter scholarships. As long as the total does not exceed the equivalent of 24 full ride scholarships, the college is abiding by the NAIA rules. This provides greater opportunities for talented high school football players to turn their passion into money for college. The National Junior College Athletics Association is comprised of 525 member colleges across the country, 67 of which have competitive football programs. These two year community colleges often offer an intermediary step for students who are not prepared, or who can not afford, to head directly to a traditional four year university. Many student-athletes neglect to consider the financial aid opportunities that may be available at the junior college level. 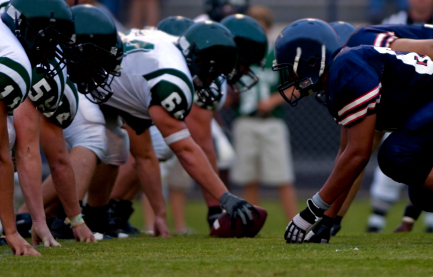 Many junior colleges offer football scholarships for talented high school graduates who are pursuing their education at the community college level. As with the scholarship programs endorsed by the NAIA, these programs offer valuable financial assistance to students who may be more interested in pursuing a degree than in pursuing a professional career in athletics. Scholarship programs at NJCAA member colleges are not as strictly regulated as those at either NCAA or NAIA schools. Every participating junior college will have their own programs, and interested students should contact their school’s athletic department and office of financial aid for details on any football scholarships which may be available. Ivy League Schools have a long standing reputation, and internal rivalry, when it comes to football. However, Ivy League Schools are restricted by their own rules from offering athletic scholarships. These schools are academically focused above all else, and while they may be part of the NCAA Division I roster they only offer academic scholarships. This is not to say that they do not wish to recruit talented football players to their campuses, but those players must be able to pass scrutiny in the classroom. Football is important to all Ivy League Schools, but as far as financial aid is concerned it is considered an extracurricular activity. Students hoping for a scholarship to Yale, Princeton or Harvard will have to succeed on their academic merits alone. College football remains one of America’s favorite sports, and commands the attention and loyalty of fans across the country. Students who excel at the game may find that their talent on the field may well translate to the funding they need to pay for college.